What better way to spend a lazy, rainy Sunday than baking cookies and doing science experiments? Our theme this time around was, as you may have guessed from the title, acids and bases. Actually, our first experiment started some time ago, when we submerged a raw egg in a cup of vinegar and I asked the boys to speculate on what would happen. Our oldest correctly guessed that the shell would dissolve, but I think he was still surprised at the results. The acid in the vinegar breaks down the calcium carbonate of the shell, a process which you can see starting almost immediately when bubbles begin to form on the surface of the egg as it releases carbon dioxide. A scum will develop on the surface of the liquid as the shell disintegrates, and after a few days you have a soft-boiled egg that has effectively ‘cooked’ in the acid, and will bounce if dropped. As you can see from the video, however, the egg is not indestructible. A very cool experiment, but you have to plan ahead. Our next round of experiments required some red cabbage, which makes a handy pH indicator. Simply slice some red cabbage, put it in a pot with just enough water to cover it, and simmer for 30 minutes or so. Strain the liquid and you’re ready to go. First, take smallish rectangles of paper (we used index cards), and soak them in the cabbage juice then set them aside to dry. While you’re waiting for them to dry, get a white plate or other suitable surface and place a few drops of the juice in several spots. 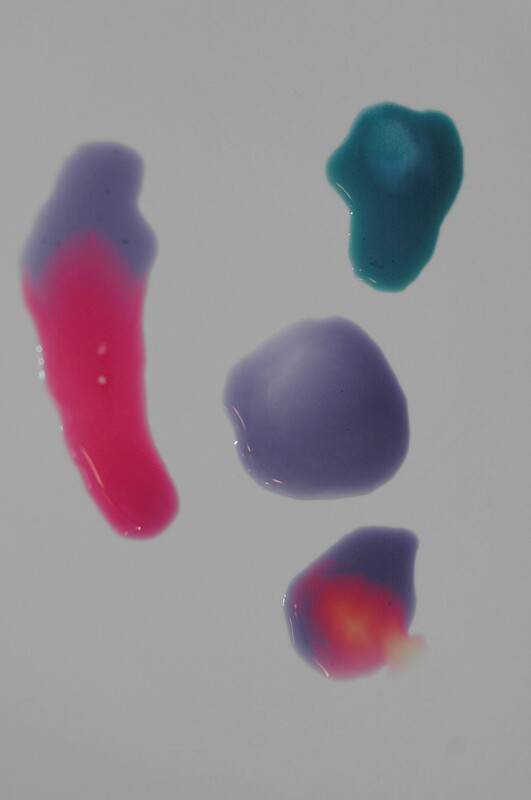 Take any acid – we used lemon juice and vinegar – and a base, the handiest being baking soda, add a small quantity to each purple pool of indicator, and observe the results. 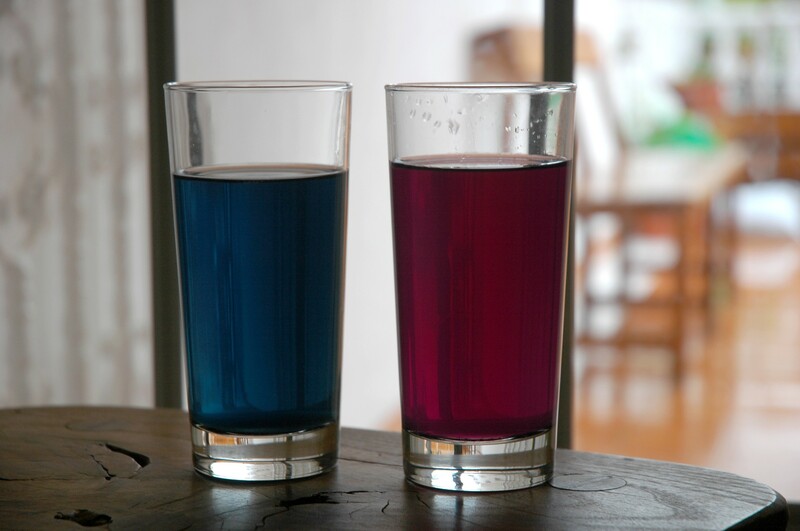 The acids will immediately turn the cabbage juice pinkish-purple, while the base will make the juice greenish-blue. It looks like magic, but of course it’s a simple chemical reaction. You could give them the explanation from Fun Science Gallery, or you could just tell them that some substances are more acidic than others, and it is the acid that gives citrus juice and vinegar that ‘tangy’ quality, which is as far as I took it with my kids. Let the kids swirl the puddles together and watch what happens. For even more amazing transformations, pour a couple of centimeters of your cabbage juice into two clear glasses, then add water until they are about 2/3 full. (If it’s not diluted enough you won’t see much color change, as I learned on our first time around.) Add an acid to one and a base to the other (for example lemon juice and baking soda, respectively). Your kids will be astonished at what happens. 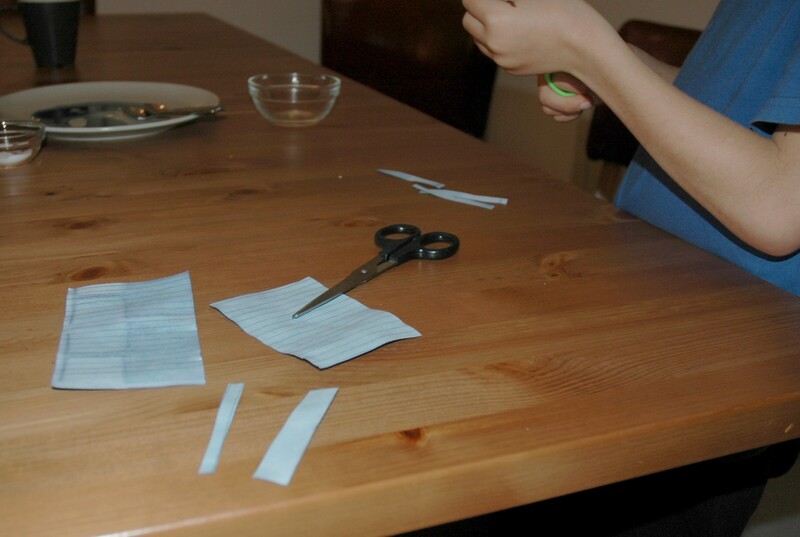 Now that the litmus paper is dry, cut it into strips and collect a selection of items from your fridge to test. 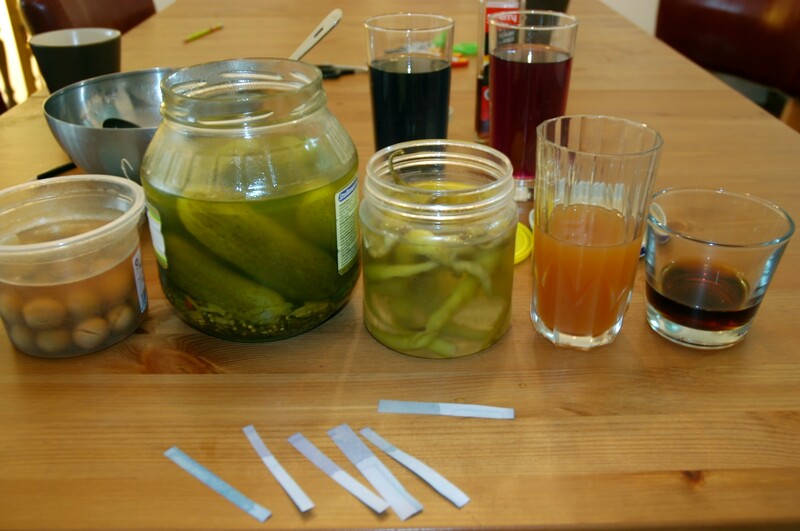 We used the brine from olives, pickles, and spicy peppers, as well as apple juice and cola. The olives, having no vinegar in the brine, showed no change. What do you think happened with the others? Is cola acidic? Next we decided to do an experiment from the Naked Scientists website, to see what would happen to tarnished copper coins when placed in various liquids. Simply take a few cups, put a centimeter or two of liquid in the bottom, and add a couple of copper coins to each one. If you can stand a few up against the edge so they are half-in-half-out, the result is even more dramatic. With that it was time to bake cookies, have dinner, and run the bath, where our final experiment of the day took place. Our jet-powered boat was once again from the excellent Naked Scientists website. Take a small plastic drink bottle, and drill a hole in the cap. Using any narrow tube such as a straw (I used the tube from a pen), thread it through the hole and take some modelling clay to seal both the inner and outer surfaces of your hole. The weight of the clay also keeps the cap end of the bottle below water. Fill the bottle 1/3 with water, then 1/3 with vinegar. Leave empty space at the top, which I didn’t do, or you won’t be able to get the cap on quickly enough before liquid spurts everywhere (which is exactly what happened to me). When the bath is ready, pour about 1/2 teaspoon of baking soda into the bottle and immediately cap it, covering the end of the tube with your finger. Place it in the tub, and let go. The reaction between the vinegar and baking soda should cause all of the liquid to blast out of the tube, sending the ‘boat’ shooting across the water. Well, I hope I’ve inspired you to try some or all of these cool experiments with your kids. Kitchen science is easy, entertaining and educational, which makes it perfect for those days when you’re simply lounging around the house. 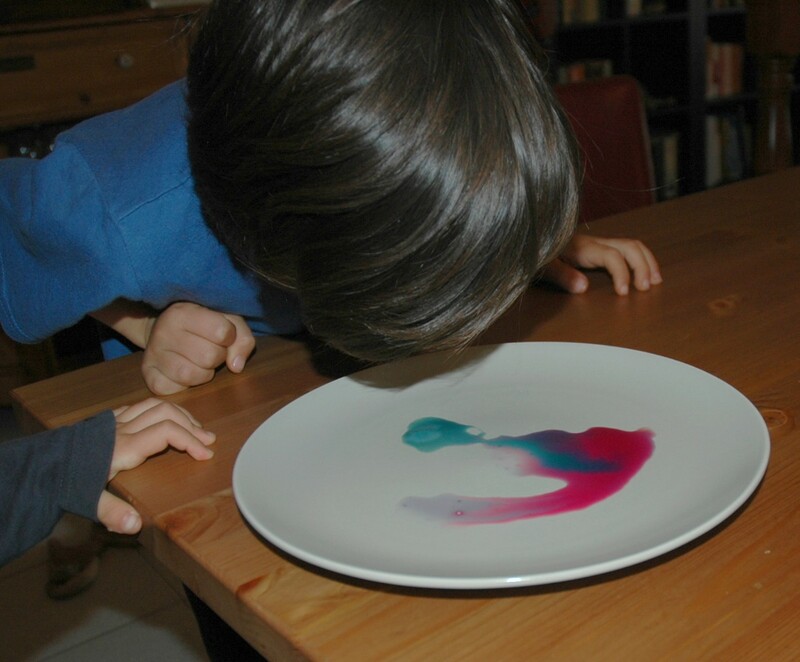 For more ideas, here are 15 science experiments you can do with your kids. Have fun, and try not to blow anything up. Wonderful post! I am going to use all of these experiments! Thanks! My pleasure! These are just a lot of fun for kids, and you always end up learning a bit yourself along the way. Cheers! Another thing you can put in vinegar (similar to the egg) is the bone from a chicken drumstick. After a few days it will be so bendy you can tie it in a knot! Cool! Going to have to try that one! Wonderful post and you are surely an exemplary father, teaching and making time for kids instead of plonking them in front of the TV. I learnt from these experiments too. Well, I plonk them in front of the tv plenty, but I do try to avoid it when I can. Thanks for reading!